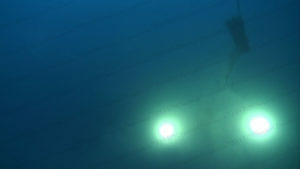 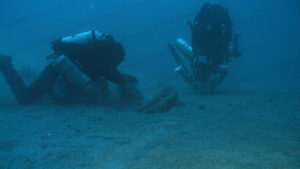 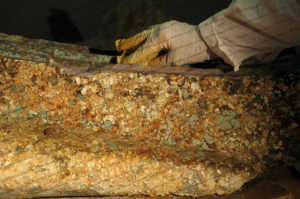 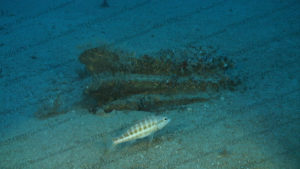 The Egadi 5 ram was recovered in 2011 in sector PW-A at an approximate depth of 85m. 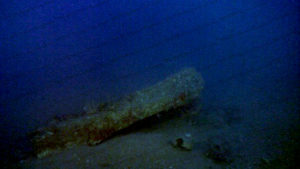 The ram was found inverted with a small piece of static net beneath it. 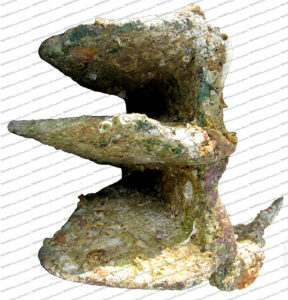 While a static net does not have the capability to move an intact ram this ram is fragmentary, having lost most of its cowl and its port side. 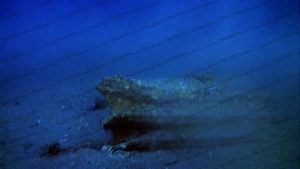 Some 30% of the upper fin remains, along with most of the bottom plate. 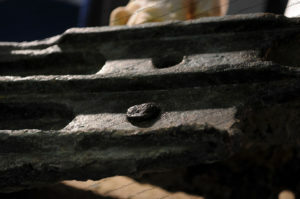 No decorations or inscriptions are to be found on the extant portion, but the groove-ridge pattern, similar to that found on the Egadi 2 and 3, is present along the bottom plate from unsmoothed tool marks in the wax layer prior to casting. 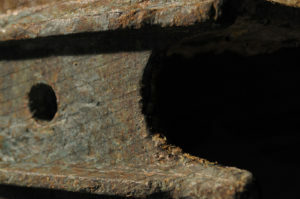 While this ram has the shortest driving center and one of the smaller head widths, its head height is on par with the other rams. 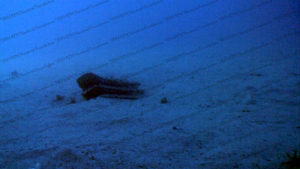 While the short driving center reflects a short ramming timber on its warship’s bow, yet the keel dimensions indicate a vessel of similar dimensions as is associated with the other rams. 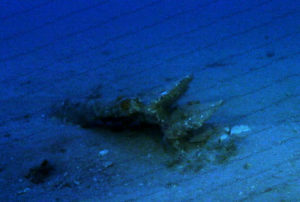 Growth on all broken edges suggest that this portion of ram has been exposed for a long period of time; however, two 2-cm areas on the broken edge of the top fin are devoid of growth and represent recent breakage, perhaps from the action of the static net. 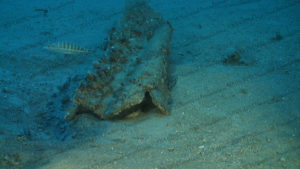 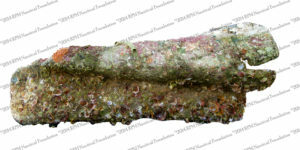 A portion of the spike on the starboard side survives curving forward into the ram’s interior which indicates that this piece of the ram was still attached to the keel when it was deposited on the sea-floor. 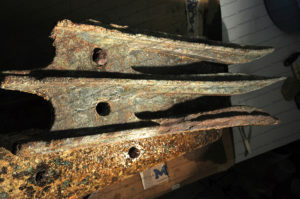 The ram’s port side suffered significant damage; a complete sheering along the longitudinal axis evidently occurred prior to deposition.